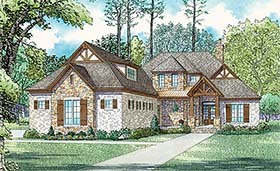 A unique blend of rustic and craftsman style design gives this home great curb appeal. The Foyer leads you into the Formal Dining Room or into the large Great Room where you can enjoy time spent relaxing in front of the cozy fireplace. An open floor plan allows the Great Room to flow into the Kitchen and Breakfast Nook and well as the Dining Room which is only partially closed off from these spaces to create a defined space. One the right side of the home you'll find Bedrooms 2 and 3, each with their own bathrooms. A hallway leading the the 3 car side load garage contains a 1/2 Bath, Pantry, and Kid's Nook as well the entrance to the larger Laundry/Craft Room. Privately tucked away on the other side of the home is the spacious Master Suite where you can enjoy plenty of natural light during the day and a great Master Bathroom featuring a freestanding tub, glass shower, and large walk-in closet. Head upstairs to find a 4th Bedroom, Full Bath, Computer Desk, Game Room and even a Bonus Room for added space if desired.